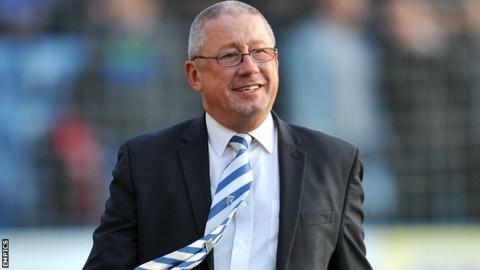 Gillingham chairman Paul Scally does not expect Justin Edinburgh to make wholesale changes at the club following his appointment as manager on Saturday. A four-man caretaker team had been in charge of the Gills since Peter Taylor was sacked as boss in December. "The continuity should continue," Scally told BBC Radio Kent. "We made it very clear to the players and Justin that we didn't want to change too much - he is joining the family as opposed to taking over it." Edinburgh, 45, joined the League One side from Newport County after the two clubs agreed compensation, which Scally said was "nothing like" the six-figure fee which Newport originally demanded. The former Tottenham defender has signed a two-and-a-half-year deal with the Gills. However, Scally has revealed some of the playing squad were in favour of keeping the four-man caretaker team in charge of the first team. Andy Hessenthaler, Darren Hare, Steve Lovell and Mark Patterson led the Kent club to two wins from five league games before Edinburgh's appointment and then oversaw victory over Sheffield United at the weekend, with Edinburgh watching on from the stands. "Quite late in the process I thought 'we haven't actually asked the players'," said Scally. "I did a private survey with the team and asked them who they thought was the right man for the job, or the type of person that should be doing the job. "I got some very interesting responses and a number of those were to leave it as it was. "The gang of four were doing very well but, of course, they have their own roles to do within the club. We all sat down and talked about it and decided it couldn't last forever. "Ultimately we had to make a decision." Hessenthaler will be Edinburgh's assistant manager, with Lovell as first-team coach and Hare and Patterson reverting to their previous roles as academy manager and development squad coach respectively.